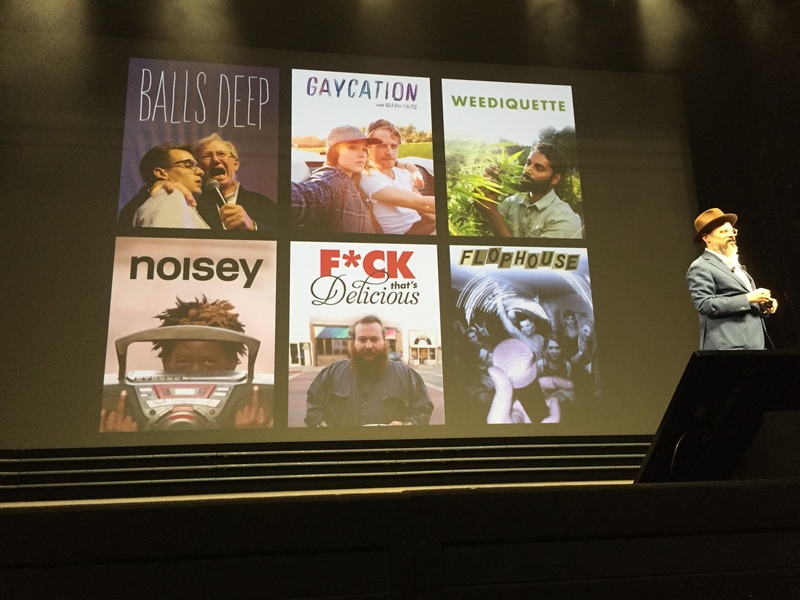 Eddy Moretti, chief creative officer of VICE Media and co-president of VICELAND, hit the stage at today’s final MIP Digital Fronts session to talk mainly about VICELAND, their newest project. Above, here he is toasting with Jean-Marc Juramie, managing director of CANALSAT (right), to announce their partnership for the launch of VICELAND in France (which will happen later this year). So what’s been new with Vice since Moretti last took the stage? Last year, of course, they launched women’s channel Broadly. And they plan to launch four more channels this year: For gaming, health, travel and money. Viceland will feature 250 hours of original primetime programming, plus various movie and documentary acquisitions. They are shooting for three more markets by year’s end, and are have already inked a Sky collaboration for broadcast in the UK. That the shows are put together and feature real people is critical to the VICELAND model. For example, States of Undress is a fashion show featuring Hailey Gates, who will travel the world—outside the fashion capitols of Paris, London and New York—to score glimpses of the deeper meaning behind fashion. “We’re extremely proud of this content. It’s beautiful, curious, made with passion,” said Moretti. “With VICELAND, we’re completing an ecosystem.” He clarified by saying that VICE isn’t moving into television; it is incorporating it into an already-existing wider constellation of platforms, which will only grow. To wit: VICE recently also worked with Samsung and sponsor Unilever to create Beyond the Frame, a virtual reality experience. Beyond the Frame will feature six or seven virtual reality films, some of which will be 20 minutes long. The makings-of will themselves be packaged into TV programmes for the channel. At this point, Moretti playfully announced the launch of VICELAND in French, with a spankin’ new trailer in the Gallic tongue. After, he reappeared onstage clutching a glass of champagne, flanked by CANALSAT managing director Jean-Marc Juramie. Earlier in the morning, Fullscreen graced the Grand Audi stage to talk about what’s giving them the glees lately. First up was Fullscreen, flanked by head of sales Kevin McGurn and vp-business development Damon Berger. The latter gave a few brief stats on what Fullscreen’s all about (here’s a handy review from October). Then McGurn and chief content officer Catherine Balsam-Schwaber of Mattel had a conversation (shown above) to reinforce the richesse of their partnership. The millennial audience is getting harder to reach, said McGurn, and the TV audience is getting older. The median age of viewers in the United States is now 50, well outside of the 18-49 set that advertisers covet. “It’s not that millennials aren’t watching TV; they are, in unmeasured ways,” said McGurn. “That’s a conundrum for advertisers and brand marketers in the room.” So as audiences leave linear TV, it became critical for Fullscreen to understand why, what they watch, and when, as well as to find clever ways to build a brand relationship with them in order to fund content experiments. One fruit of such research is Summer Break. Produced by AT&T, it’s now going into its fourth season. “We wouldn’t be surprised if it went into season five,” McGurn added, probably because the desire by youths to extend their epic summer beyond its tiny window of a handful of months, making deep personal connections along the way, is preciously universal—at least in the US, when being in school is probably the only time you’ll ever see a vacation again. In classic transmedia style, Summer Break’s content began on YouTube and slowly trickled outward toward other platforms, like little breadcrumbs leading back to the principle material. 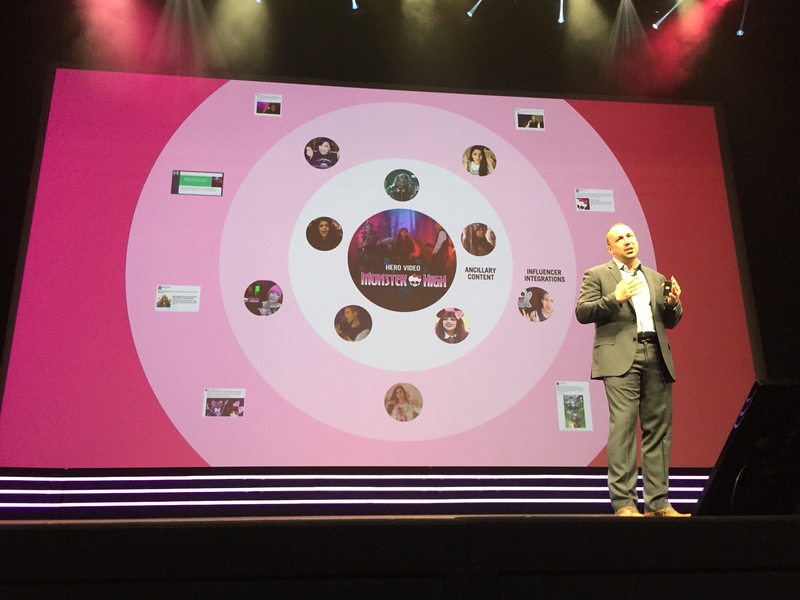 Content it helps Mattel package and diffuse includes Monster High, “A cool series that looks at the kids of the most famous monsters in history,” said McGurn. 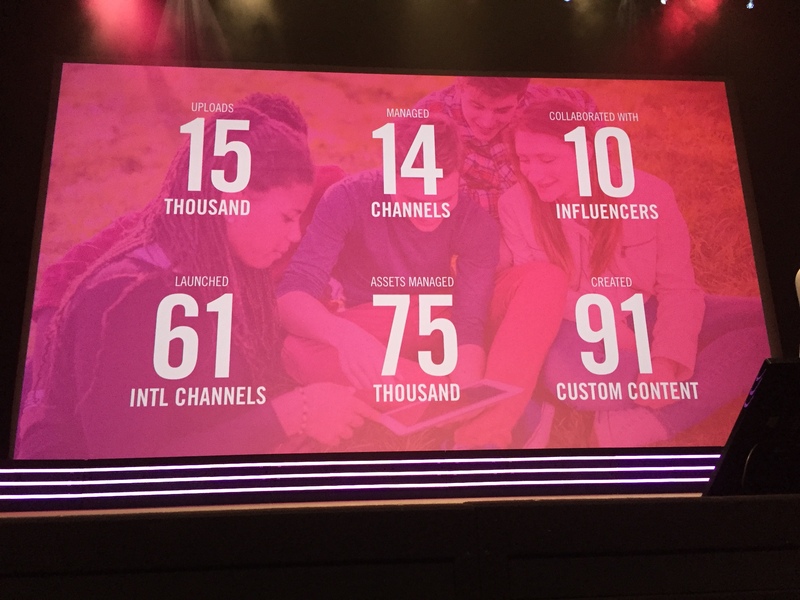 “We started with hero content, then ancillary content and fanned it out to drive tune-in and extend that relationship longer for fans,” he went on. 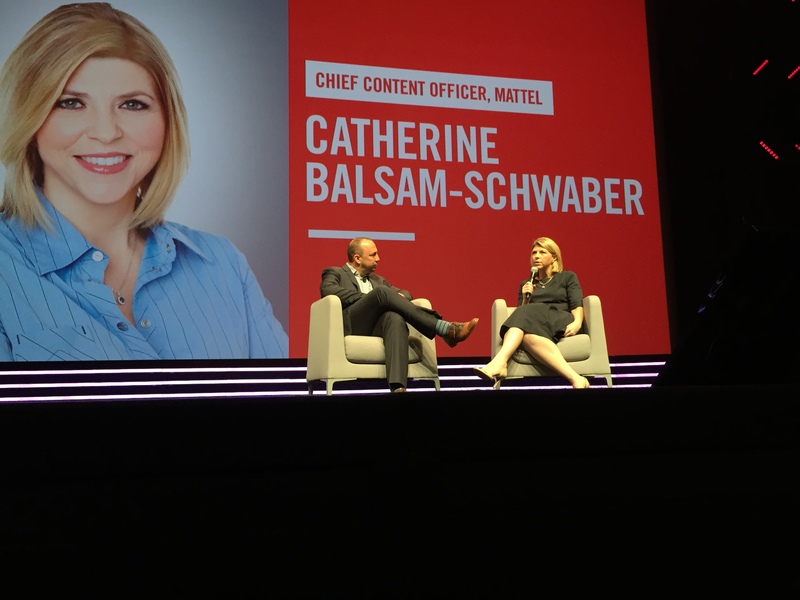 At this point, chief content officer Catherine Balsam-Schwaber of Mattel hit the stage to jam with McGurn about Mattel’s origin story, the new Mattel Creations innovation hub (excellent synopsis here), and the evolution of Barbie. McGurn began by confessing that two things fascinate him about Mattel’s illustrious past: “That the original name was Mattel Creations, and secondly the partnership with Walt Disney. When you look at companies that are successful at reaching culture in general, most start with youth culture,” said McGurn.